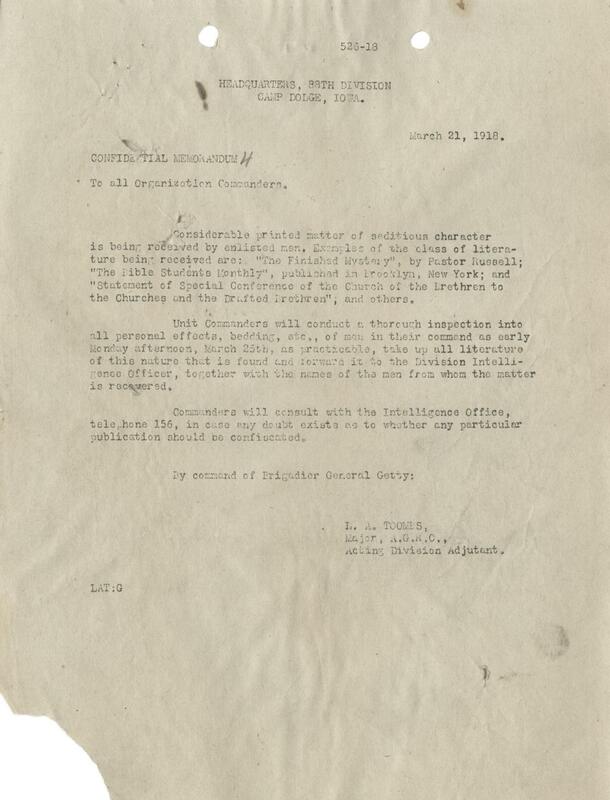 This memorandum was directed toward the 88th Division, then stationed in Camp Dodge, Iowa. It warned of seditious material, mostly in the form of listed religious books and newspapers, that were being distributed to the men. It was likely feared that certain religious material would encourage conscientious objection among troops. The memorandum orders unit commanders to search for this material and, if found, send it and the names of the men who held it to the Division Intelligence Officer. Considerable printed matter of seditous character is being received by enlisted men. Examples of the class of literature being received are: "The Finished Mystery", by Pastor Russell; "The Bible Students monthy", published in Brooklyn, New York; and "Statement of Special Conference of the Church of the Brethern to the Churches and the Drafted Brethern", and others. Unit commanders will conduct a through inspection into all personal effects, bedding, ect., of men in their command as early Monday afternoon, March 25th, as practicable, take up all literature of this nature that is found and forward it to the Division Intelligence Officer, together with the names of the men from whom the matter is recovered. Commanders will consult with the Intelligence Office, telephone 156, in case any doubt exist as to whether any particular publication should be confiscated.